The spontaneous tendency to join the largest social group was used to investigate quantity discrimination in fish. Fish discriminated between shoals that differed by one element when the paired numbers were 1vs2, 2vs3 and 3vs4, but not when 4vs5 or larger. Using large numerosities (>4), the ability to discriminate between two numbers improved as the numerical distance between them increased and a significant discrimination was found only with ratios of 1:2 or smaller (4vs8, 8vs16 and 4vs10). Experiments to control for non-numerical variables evidenced the role played by the total area of stimuli with both large and small numerosities; the total quantity of movement of the fish within a shoal appeared also important but only when large numerosities were involved. 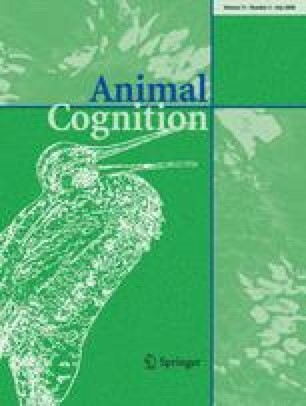 Even though the pattern of discrimination exhibited by female mosquitofish is not fully consistent with any of the existing models of quantity representation, our results seem to suggest two distinct mechanisms in fish, one used to compare small numbers of objects and one used when larger numerosities are involved. The authors would like to thank Brian Butterworth, Elizabeth Spelke, Marco Zorzi for useful comments, Jonathan Daisley and Peter Kramer for their suggestions and Maria Anna Posa for her help conducting the experiments. This study was supported by research grants of the University of Padova to AB. The reported experiments comply with all laws of the country (Italy) in which they were performed.